Did you really expect anything different American Idol viewers? 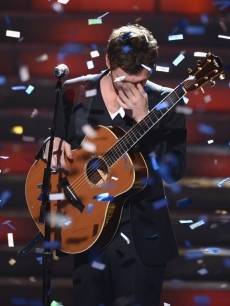 Let me add to the stockpile of congratulations for Phillip Phillips who took home the American Idol Season 11 crown last night beating prodigious R&B 16-year-old Jessica Sanchez. I recognize the population of disappointed viewers who thought that Phillips was limited vocally and his carefree “hipster” style did not deserve victory over one of the better natural singers American Idol has ever had. I agree with that sentiment to a point. Yes, Jessica Sanchez is the better singer of the duo, but the best singer does not usually win American Idol. Phillips made up for what he lacked in vocal prowess with a keen creativity and perspicacious ear for acoustic music. As I wrote last night on Twitter, he will fit neatly into the modern folk revival – much like Mumford and Sons (whom I will mention in a bit). Honestly, though, Idol Viewers, did you expect this to go differently? American Idol has just completed its 11th season and since zany bluesman Taylor Hicks took home the title in Season five, five men have won the competition, and they all (with the exception of David Cook, even though he too fits this somewhat), have been laid-back guitar-wielding songwriters. I am counting country crooner Scotty McCreery in this coterie. It is no secret who the main viewership is, and the typical 13-year-old girl loves cute, awkward, relatable, hipster artists. Phillips fit this all, and he won. But with that all said, I am happy for the 21-year-old Leesburg, Georgia product, who actually paired his American Idol victory with a completed degree in Industrial Systems Technology from Albany Technical College. My guess is his career will go more towards the former accomplishment. When you take a brief glance at this season as a whole, there were only a few individuals who actually could have made it to the finale. My original guess was that Colton Dixon would win the competition, but this turned out to be a misjudgment on my part mainly based on (and this will be the first time I have ever said this) my age. You see, as much as I like to consider myself up on music trends, Dixon fit the pop/punk genre that was popular among young people when I was like 16 years old, and I thought this was still superiorly popular. He had everything else. He was just playing the wrong music for the times. Don’t be surprised Idol viewers if someone like Phillips wins again next year. It is not gender bias, but rather a tendency to vote for what is currently in. If Florence Welch tried out for Idol, she would win. As for Phillips’ single “Home,” it fits him like a broken-in pair of jeans. The song is a short ditty with a pre-chorus drop-down that is recognizable. The song is rich with a bluegrassy guitar beat mixed with Coldplay-esque “oohs” and airy “homes.” “Home” was written by songwriter Drew Pearson, and originally meant for British artist Greg Holden (who co-wrote the song), but was submitted to Idol as a possible finale number, and was snatched up smartly by Phillips, who will now make Pearson and Holden some nice pocket-money. The song is pretty much a Mumford and Sons track. It’s not surprising that it was originally written for (and co-written by) a British folk artist. I think I can actually target out a specific track from Sigh No More where Mumford and Sons uses a similar technique. It is a similar song, not the same song. The reason I mention it is because this is exactly where Phillips will be succesful. If he taps into this indie/folk genre and hits it head on he will not flame out and will continue to be heard of come season 12, 13, 14, and heck maybe even 15 if the show lasts that long! Phil deserved it. Home sealed it i think. I was very unhappy that the best of the bunch was gone last week. Ledet was phenomenal. Of them all, Ledet and Phillips have reasonable chances to make it in the business. Sanchez, not so much, although a fine singer, she is just a singer. The other 2 pour their heart and soul into everything they sing. I also heard the Mumford resemblance straight away, then googled around to see if anyone else did and landed here. Great analysis and looks like a cool blog. I’ll fascinated by the craft of srongwriting, and it looks like you’ve got some cool posts on that topic. I’ll have a skim through. take care. Thanks for the view. It is a keen resemblance. Might I suggest taking a look at our Top 100 Lyricists series that discusses songwriting at length. It is still ongoing. Sure, I’ll check it out now. There was a fantastic article in the new yorker a few months back on the how pop hits are made… i’ll try and dig it up for you. i’m also a blogger, though more on the sports front (thefrugalfan.com), have a skim sometime when you’re free. I’m not quite as prolific as you are though! What an awesome idea for a blog! I am also a big sports fan, albeit a fan destined for constant disappointment. I was born in Queens and currently live in Long Island. So, if you couldn’t tell, I am a huge Mets and Jets fan (hence the misery!) I gave your blog a follow and look forward to reading posts as they come! Thanks! My dad turned me on the Giants as a kid, and at the time the Yankees were collecting rings, so I kinda got lucky on those fronts. I’ve been hunkering down and trying to put all my content into something publishable, so I’ve been comletely slacking on the posts, but the whole blog is due for some attention later this summer. Mumford and Sons already exists, why this copycat? It’s a shame. Years ago George Harrison got sued for the melody of My Sweet Lord being too similar to a Philip Spector song, but today copycats freely prevail? Confused…. The songs are eerily similar. You are definitely right. Can the songwriters be sued? Probably not. George Harrison (subconsciously – haha) took his song right from “He’s so Fine.” It is virtually the same song – no difference. “Home,” while awfully similar to many Mumford and Sons songs (and easy to mistake on the radio), is not a complete rip off. The song just uses the same formula that Mumford and Sons uses for their music. Folk-rock at its finest. I will admit, though, that the song does come dangerously close at times to copying Mumford and Sons. The question of course is does it steal Mumford and Sons’ intellectual property. I don’t think it does, but I’d be eager to hear what others think.